Videos: Qt Quick and Home Control demoed on N900 – control windows/light/blinds/heating! To show of Qt Quick, Nokia’s partnered with basysKom to show off the growing trend in home automation systems. Do you ever see homes of the rich with their incredible tech filled abodes, but their control pad is this massive fat brick? Why not something like your phone (at least tablet sized). 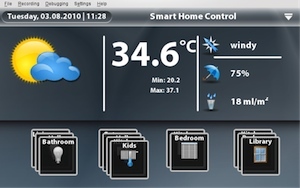 With the application a user can control and adjust various home operations from both a PC and a mobile phone. The demonstration includes several core smart home functions, such as controlling windows, blinds, heating and lighting. The various functions are triggered by the system’s intuitive integration to outside weather conditions. To prove the functionality here, the demo allows users to adjust the weather using a “weather god control” mode. …Qt Quick is a smart and quick solution to make a platform-independent application with just some basic knowledge of scripting languages. The demo took only a few weeks to produce and the re-implementation to Qt Quick was made possible by the SVG and C++ plug-in options offered by Qt Quick. It reminds me a bit of that skit with the N8 and the transforming future house. This seems like something that could be more easily implemented though (given compatible equipment). Not sure exactly sure how the phone/pc would be sending the signal to control things like lights, blinds and heating.